And so, as we come to the end of our spiritual journey across 112th Street, what's this I see up ahead? Is it? Could it be? Yes! Tom's Restaurant. Undoubtedly, more well known across the universe than the Cathedral of St. John the Divine. You'll have to trust me that this is the restaurant, but I never lie just off a spiritual journey. Never mind, I just drummed up some evidence. 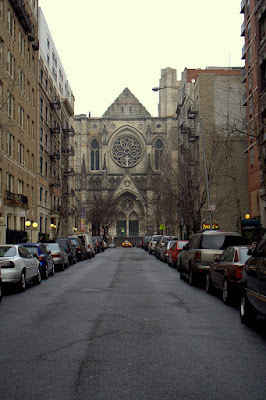 Walking back to Broadway, toward the middle of the block is a church of another sort, built in 1990. 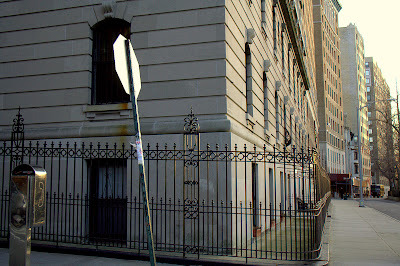 The Seventh Church of Christ, Scientist. 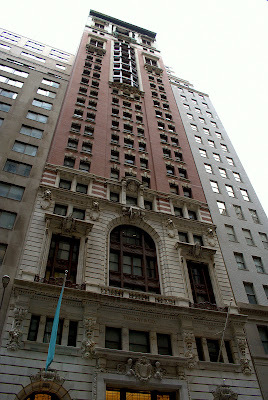 Included in the building is a 22 story apartment building. A breathtaking transition from medieval to extra modern. You can see that this street is not heavily traveled because I was standing in the middle of it with my back to oncoming traffic as I took 4 shots of the cathedral. I did look over my shoulder between shots. 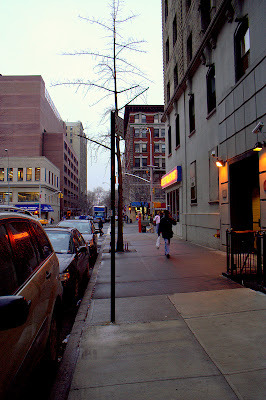 This was another post office trip, this time to 112th Street. Broadway! Can you just kind of squint your eyes and see this as a rug? 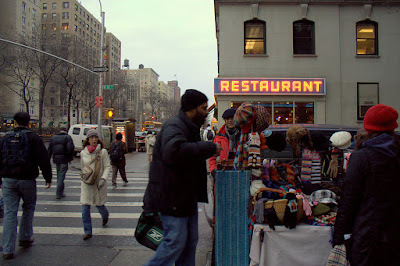 This walk was on 104th Street from Amsterdam to Riverside, then Riverside to 102nd Street and then back to Broadway to get the subway home and read my book. Life is good. "Brownstones will have a street entrance to the ground floor sometimes referred to as an 'English basement' half a story below street level but ground level with the garden at the back of the house. The first floor or 'parlor floor' can be accessed inside from the ground floor, or from the street via a grand staircase to what serves as the front door of the house." This is a long shot of this photograph. It has the English basement and the grand staircase which last night's apartments lack. 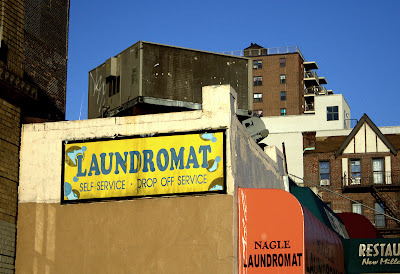 I'll be back tonight with a new photograph and not one mention of brownstone. 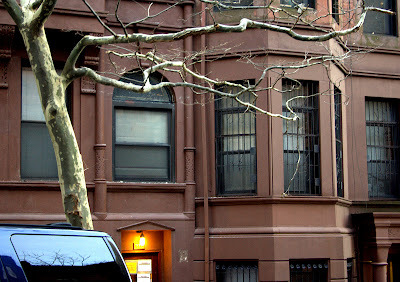 Brownstone. Just what is it exactly? Wikipedia defines it as a townhouse clad in a brown Triassic sandstone, whereas American Heritage Dictionary says it can be a more general "house built or faced with brownish-red sandstone." 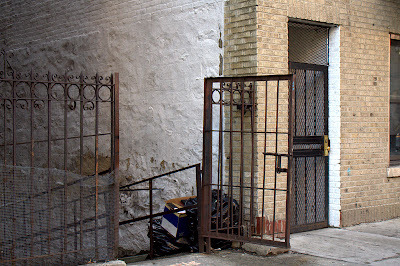 Bob Vila thinks they are faced with brownstone and also have some design qualities in common. 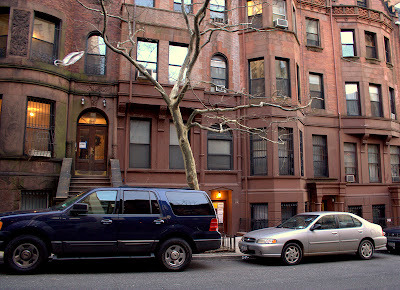 I know some people who call any townhouse a brownstone. What to do? I'm going to go with the very specific definition given in Metropolisapts.com. I like their orderly classification of apartments, beginning with pre and post-war. 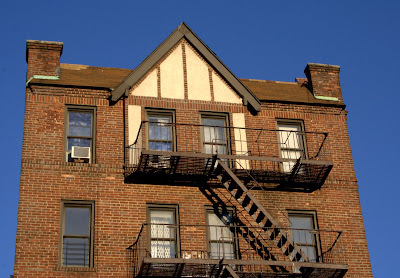 These, then, are not brownstones. You, however, may call them what you will. By the way, I learned that brownstone is also slang for heroin and that Guns N' Roses wrote a song about heroin called Mr. Brownstone. Wikipedia again. Can I believe them? Riverside Drive is a broad street alongside Riverside Park which is alongside Riverside-- no, I mean alongside the Hudson River. But in a few places, it splits into two and the split off is a more local street, not heavily traveled. That's what you're looking at here, looking south. Ummm, very nice lower half of façade. The upper half, though . . . somehow the tasteful dark red paint of the balcony and bottom window frames has been replaced with a garish, neon red orange paint around the window frames. Bad for tastefulness, good for photogenicness. Especially when there is a turquoise satin sofa on the sidewalk below. I love these trees with their calligraphic branches. Someone please tell me what kind of tree it is. 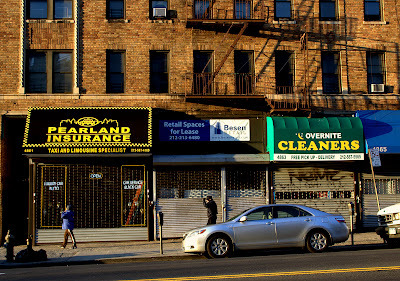 In late October last year, I took a 10-block walk on West End Avenue and complained about how dull it was: "One big apartment building after another, nothing commercial and no street life. The only reason it's not the dullest block in Manhattan (that honor falls to Fort Washington Avenue) is because the buildings are better looking than those on Ft. Washington and they have better details." Well, why didn't I show you one of those dull, but relatively good looking buildings with relatively better details? 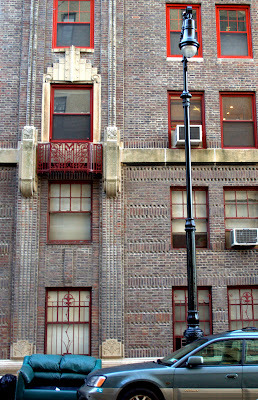 I did take photographs of 5 or 6 of them, including this very building, but didn't post any. Must have been the mood I was in. I should buy flowers more. I grew up thinking they were only for special occasions and that's wrong, wrong, wrong. I take shots of street signs on every block to keep track of my location, and every so often one of them looks good to me. I think in this case, it's the three poles. And the three wispy trees in the background. 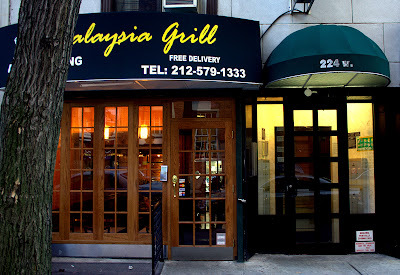 Malasia Grill, just like Barbara said. I can't resist a second shot of this market, this time from the side. Losing my job means, among other things, that it becomes glaringly obvious that my neighborhood post office is just too inconvenient. It's too far away. About 12 blocks. For some reason, those are twelve long blocks. 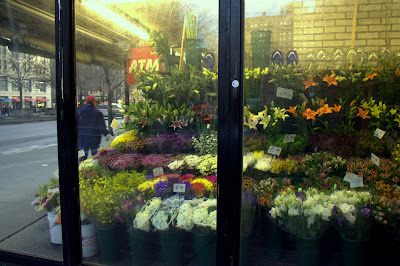 And so Tuesday, I took the subway to 103rd Street and went to the post office at 104th Street. You may have picked up that I love the subway. You get to sit down and read your book. And in the winter sometimes you're squished up between two chubby people but since you all have coats on it's not disgusting, instead it's cozy. And then when you've finished your task at the post office, instead of having to walk twelve long blocks back home, you get to ride the subway and read your book. For the record, it's Atonement. Plus I get to work a photowalk in. Here's the color I promised you. 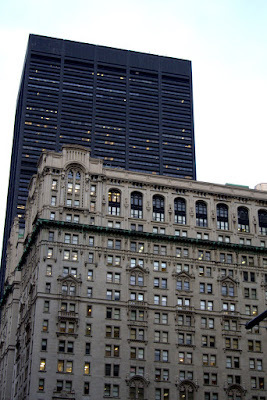 I had originally planned to come back to Wall Street and turn south on New Street, go around and back up William to the subway stop, but at New Street, I was stopped by a friendly but adamant guard. I told him I had a project to complete, but he wasn't impressed. You can walk around it, he said. Apparently we need to prevent evildoers from carrying bombs in there, but I couldn't find out what made New Street so special. Don't worry, they haven't heard the last of this. But for now, I just went back the way I came and since it was starting to get dark, this shot I took of the New York Stock Exchange was more dramatic than the ones I took earlier. I don't know about this flag. 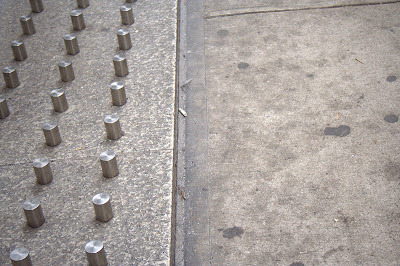 How long it's been here, whether it was put here after 9/11. 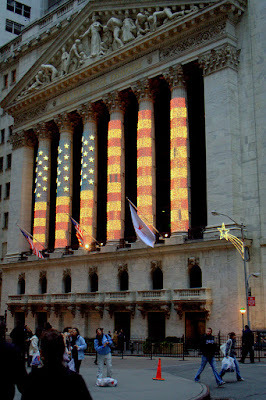 I do know that this lighted version is relatively new because I saw a photo dated July 2007 which had a cloth flag stretched over all the columns. And now we're at the end of this long string of vertical photos. Tomorrow begins a new walk with horizontal colorful photographs. 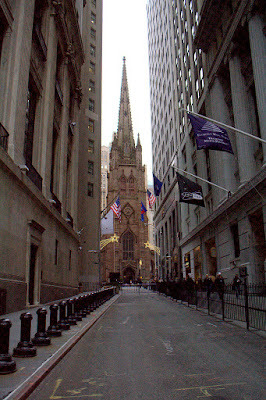 Shot from Rector Street, these buildings are north of Trinity Church. The old and the new – nice foils for each other. This is to the side and behind the Trinity Church spire. Trinity Church was built in 1846 and is the third church to stand at this site. The first was destroyed in a fire in 1776 while the British held New York; the second was torn down in 1839 after being weakened by severe snow storms. 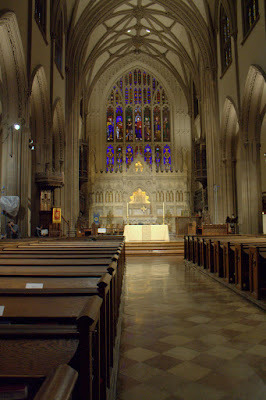 NYC-Architecture.com has a nice gallery of old images of the current church. I particularly like the one that shows it as the tallest building around. Sorry to be so late tonight; I saw Die Walkure at the Met with cousin Henry and that's a long opera, Not this long, of course, but afterwards one must stop for a drink to discuss the finer points and then on the way home one must stop at Westside, the market that never closes, bless you, Westside, and then I got home at 2. Now it's 3:30. I had to, you know, check the mail and the email, feed the cats, have some cheese and crackers and attend to various other pressing matters. 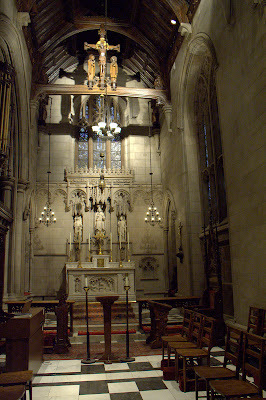 So now here are two interior shots of Trinity Church. Although I'm not religious, I do love churches for their beauty and their hushed stillness. Note: so far, the comments to last night's post more or less bolster my opinion. Other opinions are encouraged. 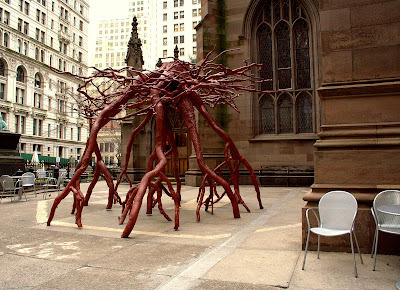 This sculpture is in the churchyard of Trinity Church and is a copy of the roots of a tree that was uprooted in the 9/11 attack. 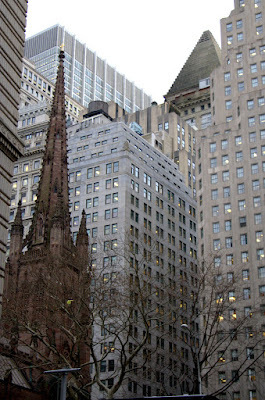 The story briefly: A giant sycamore tree grew in the churchyard at St. Paul's Chapel at Broadway and Fulton Street. When it was uprooted, it fell in such a way that it protected the Chapel and the graveyard. Sculptor Steve Tobin made this to symbolize "our connectedness and our strength after the tragic events of September 11." For more details, go here. All well and good say I, but do you get that from looking at this? It isn't enough to have a lovely concept; the sculpture also has to enbody the concept in some visual way – it has to look like it. I don't even get the idea of roots because trees don't stand on their roots. Roots are not legs. To me it looks like a giant monster spider and I do not get comfort from it. Please tell me what you think in a comment. If everyone thinks I'm a philistine without a spirtual elbow to lean on, I'll take another look and try to better myself. I've already been thinking of taking up meditation. On the Fourth of July last year, I took a similar shot looking down at Trinity Church, but it had a different look. 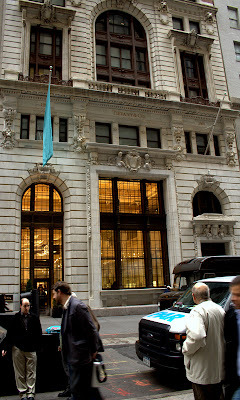 Here's Tiffany & Co., right here on Wall Street. When I saw it, I assumed that it had been here forever and I just didn't know, but it turns out they opened here in October 2007, not so long ago. Don't worry, all you Upper East Side jewelry addicts; the Fifth Avenue store is still there. 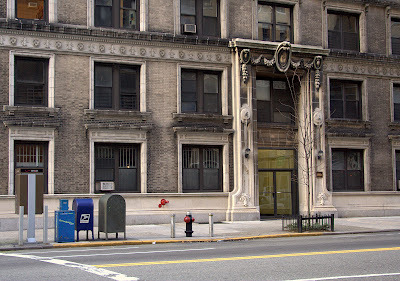 However, the company did start out here, just around the corner on Broadway, in 1837. 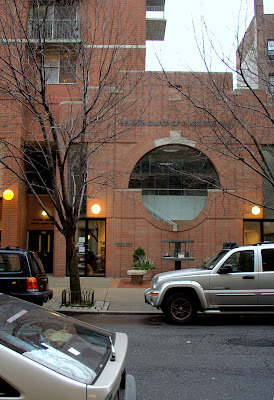 Read all about their new building and what they did to it in this New York Times article. As often happens, when I came home and read about where I was, I wish I'd gone inside. Well, it's because I didn't know. I just thought it was boring old Tiffany's and all the beauty was on the outside. Today I had the luxury of being able to choose anywhere in Manhattan for a photowalk since there was no place else I had to go. I had various considerations in mind, like where have I not been for a while (or ever), spots on my map I want to tidy up, adding a new street to the labels column (what everyone else on the web calls tags), bare spots on the map I want to make a mark in. What I finally decided was to go as far as I could. So I took the 3 train down to Wall Street, not forgetting a thick book. And now I'm sorry to say, I'm going to start on a cranky note. Have you figured out what you're looking at in that photograph? 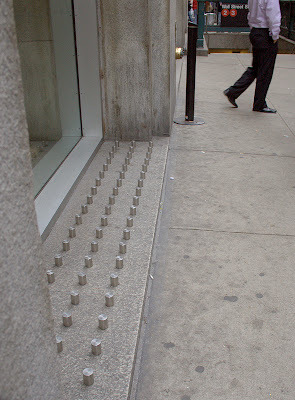 Couldn't they figure out a nicer way to keep people from camping out in their nook? Plants, maybe? 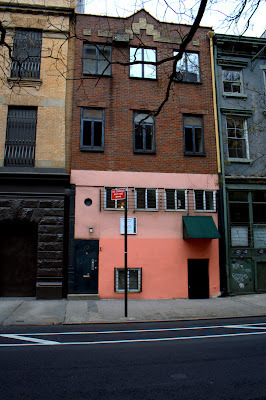 The sign on the building says Townhouse for Sale. 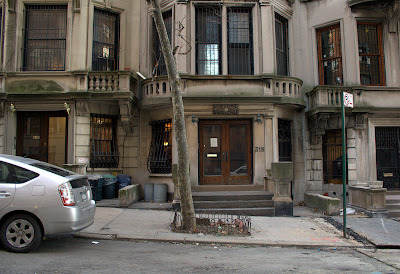 For those of you who might be interested, here's a shot of the entire townhouse. When we come back to this area on another walk, I will discuss why Noho? PS Politics was almost as fun today as it was yesterday as all the guys and gals opined as to why everyone got it wrong. 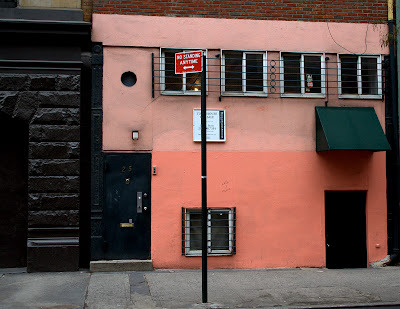 This is the building next to the theater at 45 Bleecker Street. And now I must get back to the political news. How much will Obama win by? Where will Mike Huckabee come in? Is this the end for Romney? If you like politics at all you've got to love this year. Last night you saw where I ended up yesterday. This is where I started. 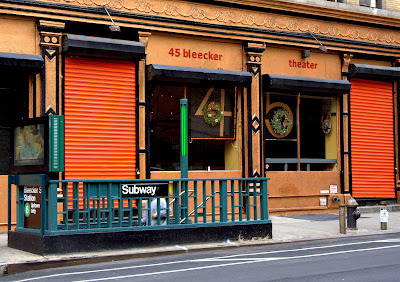 Took the 6 train to Bleecker Street and right there at the subway stop was Bleecker Street Theatre which I've never heard of. If you follow the link, you'll see that their next production, about the Iraq War, features such people as Janeane Garofalo, Bebe Neuwirth and David Strathairn, not exactly unknowns. These little theaters are all over the place. I once went to a production of Sweet Eros by Terrance McNally in a storefront with about 40 seats, sat in the first row, about 4 feet from the performers. It was wonderful. Directed by Grant McKeown. This city is full of talent, and artists of all kinds have to scramble to find a way to perform/present their art. Okay, I finally broke out. 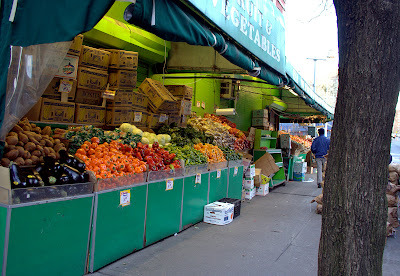 This is not only not Inwood, but it is a whole new neighborhood for this blog. Don't know how long it's been called NoHo, but I found a NY Times reference to it in 1972. This came up on the first page of a search. When I have more time, I'll search exhaustively. You bet. Anyway, this is where I went today. 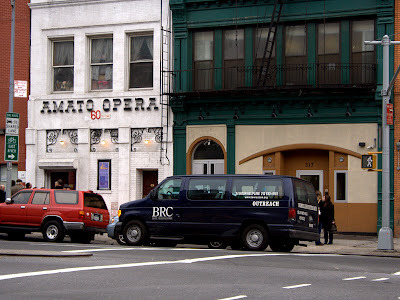 Amato Opera. It was thrilling! A tiny little opera house (127 seats) with great acoustics that blow(s) you away with these great big voices. Myra and I saw La Boheme which I've also seen at the Met. You know the second scene in the tavern with all the people milling around? You know how it is at the Met on that vast stage and you're looking down at it from the balcony and you see all the people from far away and wonder how much money it cost to stage it and is that why you can't afford to go to the Met anymore and it's sort of ho hum? Well, here you're practically in the middle of it but somehow they choreograph it so it all works out and you just want to break out laughing. I'm a fan. Why did it take me so long to get here? And did I say it was cheap? $35. You say you know nothing about opera and couldn't care less? Oh. And anon from last night: thanks, I know what you mean, but sometimes you just got to get out of Inwood. 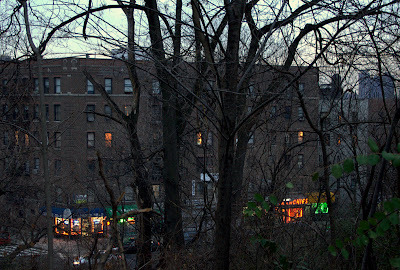 Here we are, still in Inwood. I promise you, pretty soon I'm going to get out of here and go on a long walk in some distant place, like . 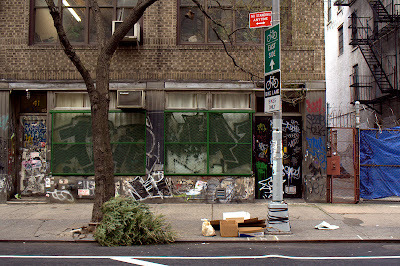 . . like. . .oh, the Lower East Side. 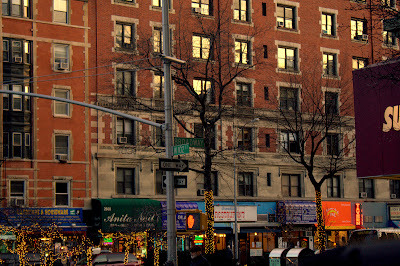 Today I had planned to go at least to Harlem, but it was not to be. What with one thing and another, I ran out of time and at the very last minute, took my camera with me on my trip to the grocery store to buy sour oranges. The final sunny shot of January 1, 2008. Note the man across the street shading his eyes. I want to tell you, it was sunny. By the way, have you noticed that we're almost through the first decade of the 21st Century and no one has addressed the question of what to call it? The oh, ohs, e.g., or the zeros. Back at the end of the 20th century, this question was widely discussed, but I've heard nary a word since December 31, 1999. So yesterday, New Year's Day, I was in a hurry to shoot while the sun was out, so I took the No. 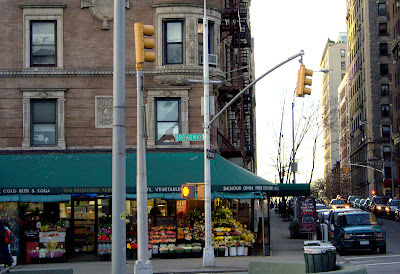 1 to Dyckman Street and walked one block up Nagel to Academy Street. This final three blocks of Academy was pretty dull photographically speaking. One can always look up. A sky like this seems to call forth that age-old question: Mommy, why is the sky blue? Happy New Year everyone. I hope you all got plenty of sleep and have been busy fulfilling your resolutions. I, myself, got up extremely late today (with good reason) and have decided to put off the resolution thing until tomorrow. Except for one. I was looking vacantly out the window, coffee cup in hand, and noticed that although rain had been predicted and it was mighty gray out there, it wasn't actually raining, and since I do like to start the new year with a photograph taken in the new year, I was pondering the possibility of getting dressed and going out there. While I was mulling it over, the sun broke through and dramatically transformed the scene outside my window. Well that galvanized me, although I was pessimistic that it would remain sunny long enough for me to get some shots. 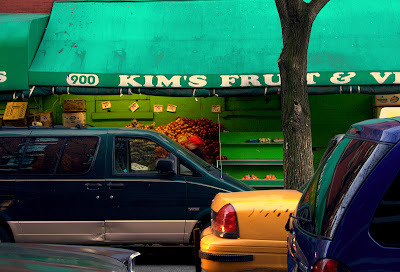 For that reason I picked a location close by, yep, Inwood. Here's the good news, folks. The days are getting longer! You heard it here first. That sun was still shining at 4:15. So although I'm sure there's plenty of miserable weather ahead of us and spring will take forever to get here, we can all take comfort in the lengthening days. Oh, thank goodness. Um, Happy New Year. It's theoretically the next day, that is, January 1, 2008, but we who are still up know it's not. It's still 2007. Let's all go to bed and wake up very late and face the New Year bright eyed and rested. Good night. Oh, yes, forgot to say, this is the theater where Rent is playing. 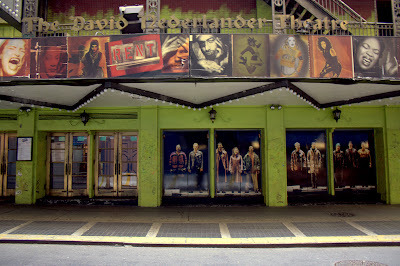 Rent, which is based on La Boheme, which takes place in Paris. But based in New York, it's called Rent. But of course.